For fans whove tracked the broken glass and ruby slipper journey of Guns N Roses lead guitarist since the release of Appetite for Destruction two days before his 22nd birthday 25 years ago this July, one cant help but be radioactive with enthusiasm. Apocalyptic Love is not just a new record by the storied musician with the black top hat and magical gift for riff, for Slash and his three co-conspirators; it is, indeed, destiny. And everyone involved is poised for the ride. "The entire album was recorded like a live performance record where the band was all set up together in the big room," observes producer Eric Valentine, whose Barefoot Recording Studios in Hollywood provided the fertile sonic soil for Love to blossom. 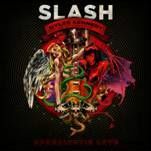 The liberated feel of Apocalyptic Love is evident throughout the LPs 13 songs, as is the genuine chemistry between Slash and lead singer, Myles Kennedy. The evolution of their creative relationship went full throttle since the two first joined forces on Slashs 2010 debut solo release where the Alter Bridge front man lent his pipes to the cavalcade of venerable guest vocalists which included Iggy Pop, Ian Astbury and Ozzy Osbourne. The communion of Slash and Myles does ring that destiny bell a bit. With songs like the debut single, "Youre a Lie," "Standing in the Sun," "No More Heroes," "Bad Rain," and the riveting ballad, "Not for Me," voice, lyric and axe form a holy performance trinity of extraordinary passion, power and authenticity. Few will argue that Slash has evolved with grassroots relevance and reverent pace over the past decade where he now rightfully belongs in the pantheon of axe mythology, having been selected by a Time Magazine survey as second only to Jimi Hendrix among electric guitarists. Staying focused on your current musical project whilst in the midst of swelling adulation and swirling speculation is no easy feat. But somehow, Slash manages to keep his eye on the apocalyptic prize.